An employee died earlier this month when the forklift he was operating rolled over in the yard area of a US store. He jumped and the forklift crushed him. 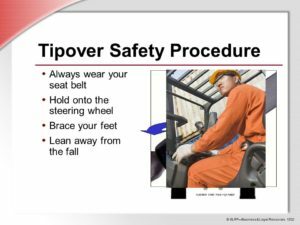 Once again please watch this reminder of how to avoid tip-overs and what to do if your sit-down counterbalanced forklift does tip. This is still the most common cause of fatality for forklift operators.